The exotic pepper and citrusy taste of Indian cardamom is perfectly matched with Italian Apricots in smooth 33% cocoa creamy milk chocolate. Milk Chocolate (Sugar, Cocoa Solids 33% (Cocoa Butter, Cocoa Mass), Milk Powder 30%, Emulsifier (Soy Lecithin), Vanilla Flavour), Apricot Pieces 5% (Apricot Puree 53%, Sugar, Dextrose, Oat Fibre, Acidity Regulator (Citric Acid, Tripotassic Citrate), Gelling Agent (Sodium Alginate), Natural Flavours, Natural Colour (Paprika Extract)), Cardamom Powder 0.1%, Natural Cardamom Extract. 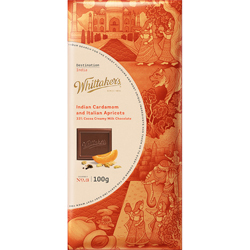 I had a block of the Whittakers Indian and Cardamom as Apricot sent to me at Christmas along with other Whittakers chocolate and I saved this to last so I could savour it and it was well worth the wait. The flavour is a light citrus and pepper from the cardamom and the apricots are delightful just a hint of apricot and they have been finely chopped to give that bit of extra texture (bite into a morsel of apricot and you get a burst of flavour on your tongue) and flavour so overall I think I would make it my favourite Whittakers, well until I get to try the Whittakers Canadian chocolate which has Canadian maple syrup taste combined with the texture of pecans and waffles.